HomeMagazineWhy are Milk Prices Low When Butter and Butterfat are at Record Highs? Why are Milk Prices Low When Butter and Butterfat are at Record Highs? 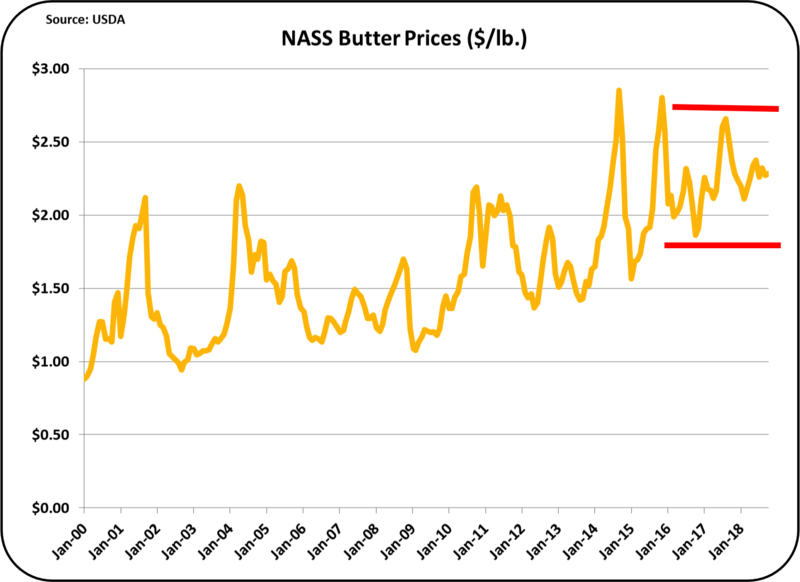 Butter and butterfat prices have been at record high levels for the last four years as shown in Chart I below. 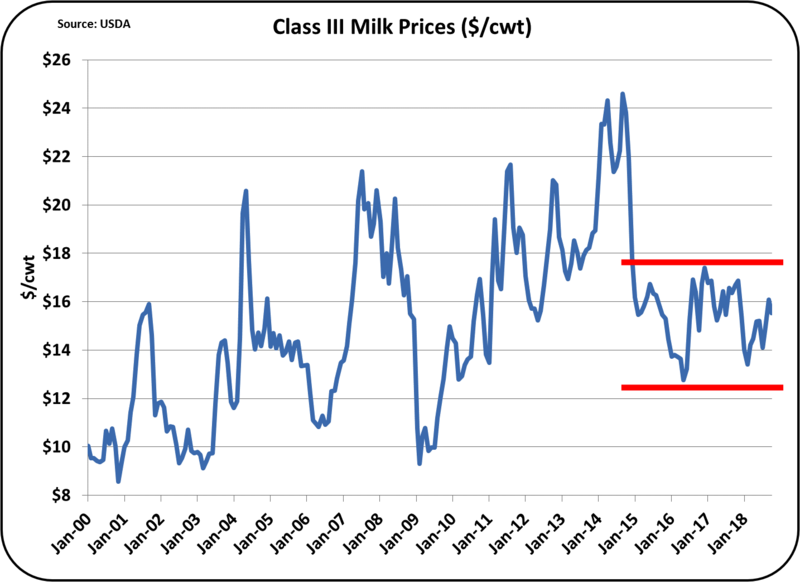 Never-the-less, producer milk prices have been low for this same time period as shown in Chart II below.. The low prices have made milk production unsustainable for many producers and have driven many producers out of business. How is it possible to have record high butter and butterfat prices and still have unsustainable milk prices? It’s all in the formulas. 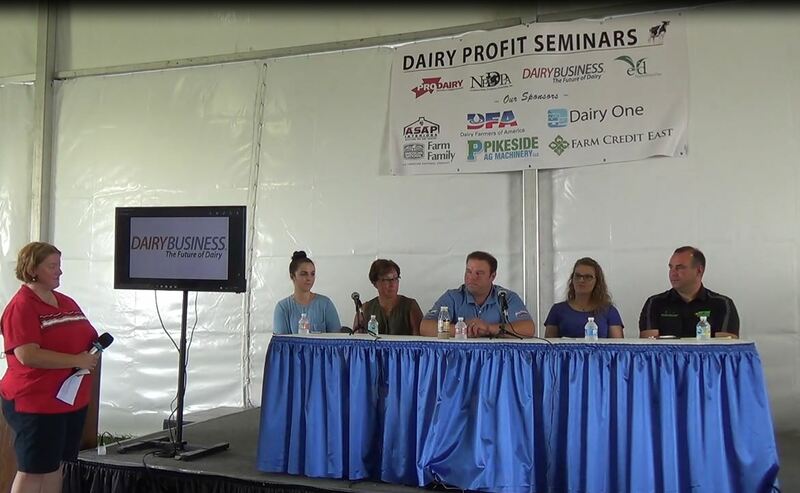 This blog deals primarily with factual analytical data about the dairy industry. However, there are few posts about the formulas that play an important part in the analytics. The reason is simple, most readers do not want to read about formulas. While low readership is expected for this post, it will review some of the formulas not covered in detail in prior posts to this blog. 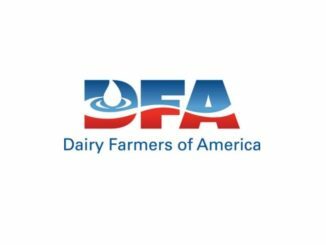 The first formula to be reviewed is the butterfat pricing formula. As shown below, it is strictly based on the the price of butter. The butter price is reduced by $.1715, the cost of churning butterfat into butter, and multiplied by 1.211 to adjust for the yield of butter from butterfat as water and other items are added to the butterfat. 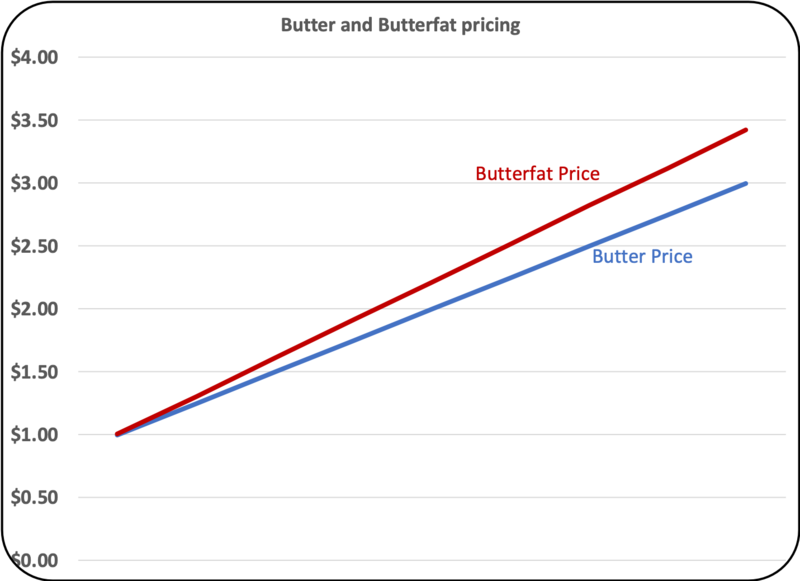 This formula leads to a straight-forward linear graph which simply means that if butter goes up in price, so does butterfat (Chart III). The second formula to be reviewed is for milk protein. As shown below, this is obviously a much more complicated formula. The first part, ((Cheese price – .2003) x 1.383) is just the same form as the butterfat pricing formula with a price for cheese less the cost to make cheese times a yield factor. However, there are a very significant additions to the formula. The second part represents the incremental value of butterfat when it is used in cheese instead of butter. That second part gives credit for the increased value of butterfat in cheese to the protein that coagulates to keep the butterfat in the cheese. It makes sense when cheese is more expensive than butter. 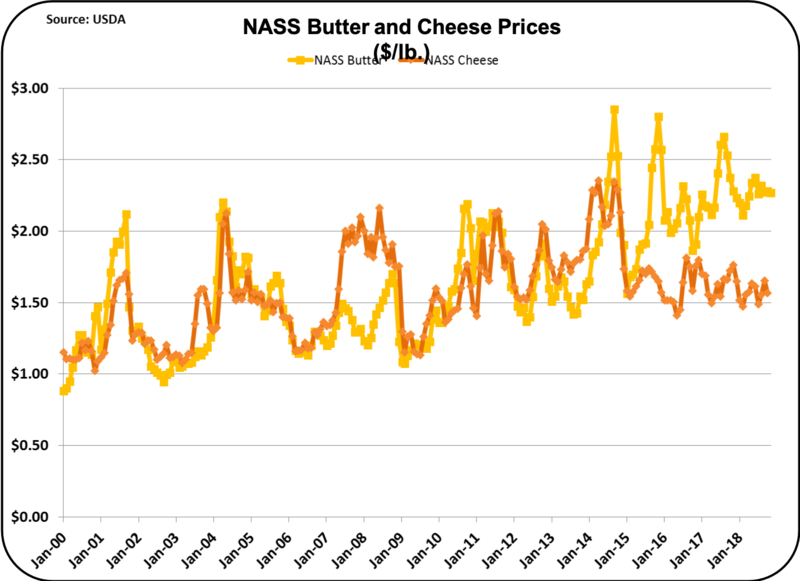 However, at today’s butter and cheese prices shown in Chart IV, butterfat is more valuable when it is used in butter than in cheese. From the simplified formula above, it is obvious that as the price of butter goes up, the price of protein in milk goes down. 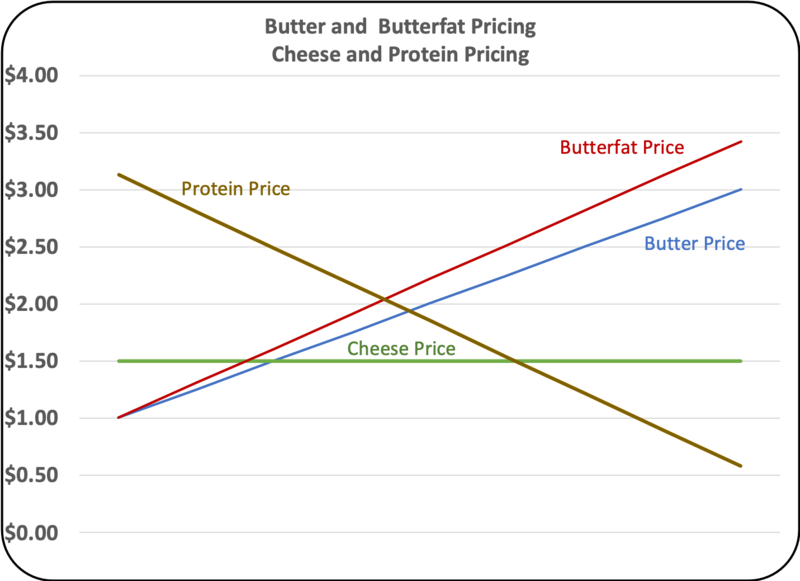 In Chart V below, as the cheese price stays constant at $1.50, and the butter price goes up, the price of milk protein goes down. In fact, it goes down by an amount nearly equal to the increase in the price of butterfat. In other-words, the milk price change overall is minimal as the price of butterfat and protein cancel out when butter changes in price. 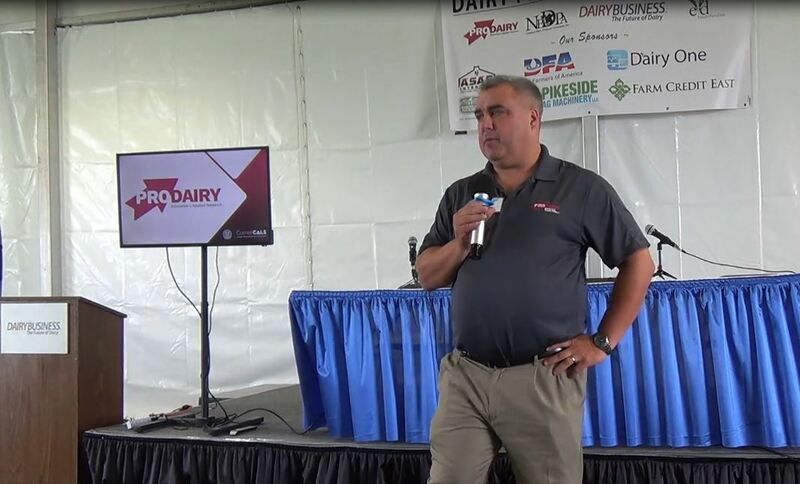 Butterfat becomes more valuable while milk protein decreases in value. If the cheese price were to increase, it would increase the price of milk protein with no impact on the butterfat price. Therefore, when cheese prices are high, milk prices are high. But the butter price has a very minimal impact on milk pricing overall. So, as long as cheese prices stay low, producer milk prices will remain low. 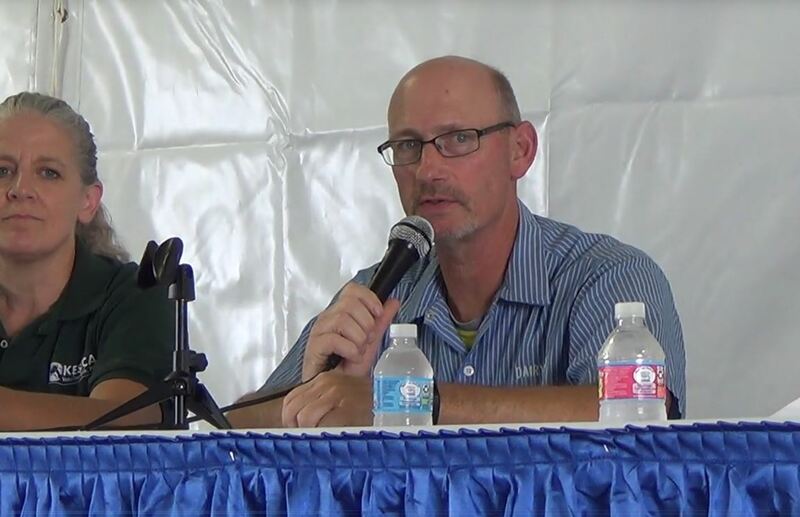 A producer can make more money if he increases the amount of butterfat or milk protein, but if the only thing changing is the butter price, revenue will be shifted more toward butterfat than protein, but the overall milk price will not be significantly changed. 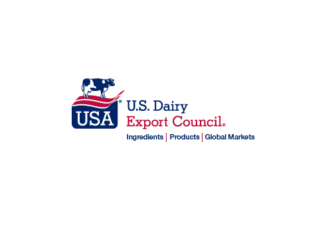 The U.S. dairy industry is in an unusual period where cheese inventories are high, causing low cheese prices, while butter inventories are low, causing high butter prices. As we enter into 2019, there are no apparent trends to change this. Unless there are some changes in inventory levels, low milk pricing will continue while butter and butterfat remain high priced.